I started working as a GIS Analyst within the IT department here at the Comm Center approximately six months ago. 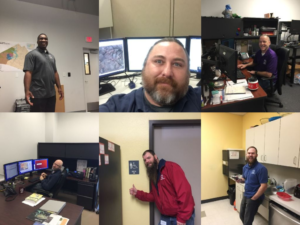 Being a bit of newbie to our IT team here at Bell County I wanted to share a story that shows the team’s dedication to our jobs as well as a proven testament to what we are capable of. About two months ago during a routine building maintenance check a staff member found that one of the main power cables insulation to our building had had become worn to the point that the wire was nearly exposed. At this point we knew that an arc could have crippled the entire Comm Center. We soon realized that we would have to shut down the entire operation in order to have this cabling replaced. Within a matter of days, we had pulled together several generators to power lighting inside and outside the building. We provided all workers with a handheld lighting device and headlamps just in case. The dispatchers were set up to take calls and manually record data that could be imput at a later point. We devised a plan on how to shut down all of the systems and servers in place and in what order we were going to restart everything. For those of you who work in this field you understand this is not like just restarting your computer. In less than a week we had made our plan and at 3:30 a.m. on a cold Thursday morning we shut the Comm Center down. The repairs were made in less than an hour and by 5:45 after one server fail and replacement and some rigorous testing, we had everything up and running again. In light of this event happening we have become proactive and have opened a backup location which allow us to completely transfer all operations to this location in the event that something like this ever happens again. Not only did I learn a lot about the behind the scene mechanisms that go on during the day to day work, but more importantly I learned that we are much more than just the skills, knowledge and a passionate work ethic to handle hard tasks. We have a lasting camaraderie you don’t find everywhere, solidifying my decision for coming to work for the Comm Center.